This week the Public Interest Advocacy Centre defended consumers who will lose choice and cash if Bell Canada's $3.4 billion takeover of Astral Media goes through. On Sept. 12 the Ottawa-based group of lawyers and researchers vigorously defended consumers at Canadian Radio-television and Telecommunications Commission hearings in Montreal. PIAC also got the stopthetaker.ca message out to the public in a series of news reports including one on CTV National News with Lisa LaFlamme. J. Goss + Associates provides communications services to the Public Interest Advocacy Centre. We work with people who want results. Success stories begin and end with our clients. For help with your media and communications programs contact J. Goss + Associates. telecom analyst at SeaBoard Group and Evan Solomon discuss Bell Canada's proposed $3.4 billion takeover of Astral Media. "If the purchase goes ahead, Bell will force higher prices and less choice on their customers and their competitor’s customers, the consumer group’s counsel Janet Lo said last month," Bloomberg News reported. "Almost 90 per cent of Canadians subscribe to TV services, says Janet Lo, legal counsel with the Public Interest Advocacy Centre. 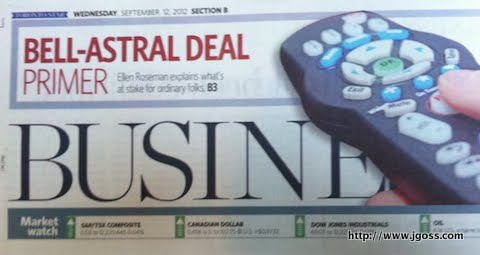 Revenues per subscriber grew to $59.73 a month in 2010 (from $46.56 in 2006)," the Toronto Star reported. « Le patron d'Option consommateurs ne cache pas son irritation sur la tournure du débat, qui gravite surtout autour des intérêts de l'industrie » QMI a rapporté. Globe and Mail reporters Simon Houpt and Steve Ladurantaye filed a 2,000-plus word story on BCE "plunking down $3.3-billion to buy Astral Media Inc." The Sept. 1 Globe and Mail report quotes Professor Dwayne Winseck, "Just maintaining the normal rules of the markets, we know that too big is too big. It impacts pricing and it impacts innovation." The Public Interest Advocacy Centre commissioned research from Prof. Winseck for its Aug. 9 submission to the CRTC on Bell-Astral.